Fresh on the scene in 2018, Wild Casino is set to be a popular choice for players from a range of countries seeking a safe and user-friendly platform to play real money casino games. Hosting instant-play and downloadable games from BetSoft and Nucleus Gaming, and offering multiple payment methods from credit card to Bitcoin, read on to find out what WildCasino.ag has to offer – including some sweet bonus offers and promo codes. What players does Wild Casino cater to? ver 190 countries, including the United States, Australia, New Zealand, Canada, South Africa and many more. Given its association with BetOnline.ag, another reputable online casino site, Wild Casino has become especially popular with the American gaming market. Wild Casino does not accept players from Macedonia, Malta, Montenegro, Serbia, Ukraine, Egypt, Ghana, Morocco, Nigeria, Pakistan, Indonesia or Panama. 100% Slots Deposit Match – Enter promo codes WILD1, WILD2 and WILD3 when making your first three real money deposits to get a 100% match up to $1000 to use on valid slot games. This bonus is subject to a 30X wagering requirement. 100% Video Poker Deposit Match – Enter promo code VIDEO100 when depositing to get a 100% match up to $1000 to use on valid video poker titles. This bonus is subject to a 60X wagering requirement. WildCasino.ag also offers all kinds of other bonuses, so head to the ‘Promotions’ page to see what else is currently up for grabs. Note: All casino bonus offers at Wild Casino come with wagering requirements attached, so make sure to always read the fine print before making a real money deposit. The bonus offers are optional, which means entering a promo code is required to take advantage of any offer, and failing to miss this step means you will miss out on the bonus. A downside of WildCasino.ag is there doesn’t seem to be a loyalty reward or VIP program. This is a big thumbs-down for the site, as most of Wild Casino’s competitors offer an incentive for players to remain loyal to their site by offering reward points programs, with points earned for real money play that can later be redeemed for bonuses, free spins and cash prizes. Wild Casino offers the option of instant-play and downloadable software. To take advantage of the no-download instant-play format, simply click to load games directly over your Web browser, with browser based games available for both desktop and mobile. For those who prefer to play via a downloadable platform, the Wild Casino downloadable client can be accessed by visiting the ‘Casino Download’ section, with software compatible with Mac and Windows PC. Wild Casino hosts games exclusively from software developers Nucleus Gaming and BetSoft. Nucleus is a relatively new and unknown game studio, although if you’re familiar with Betsoft casino software some of Nucleus Gaming’s titles may look incredibly familiar. Nucleus Gaming seems to have brazenly copied BetSoft’s 3D slot games almost exclusively, just making small alternations to the game title, artwork and soundtrack, while using the same number of paylines and special game features. Whether or not this is within any kind of copyright infringement is unknown to us, but Nucleus Gaming seems to have gotten away with ripping BetSoft off by building each game from the ground up using their own in-house developers. Either that, or Nucleus Gaming is actually owned by BetSoft, with the brand creating a spin-off to operate in the grey-market. We’ll continue to investigate and will update this review if we find out more about this bizarre parallel. Slots – Vegas Road Trip, The Family, There’s Gold Yonder, Fruit Serenity, The Party Guy, Rollin’ Trolls, Critters, Spin to Ride, The Job, Sashimi Dreams, Fire Crackers, Gepetto’s Toy Shop, 12 Animals, Matinee, Sweet Treats, Kitty Cutie, Mr Vegas, The Glam Life, After Night Falls, Birds! and Gladiator. Blackjack – American Blackjack, Single Deck Blackjack, European Blackjack, Super 7 Blackjack, 21 Burn Blackjack, Red Dog, Pontoon, Pirate 21. Table Games – American Roulette, European Roulette, Craps, Common Draw Roulette, Zoom Roulette, Baccarat, Top Card Trumps, Three Card Rummy, Virtual Racebook 3D. Video Poker – Joker Poker, Split Way Royale, Bonus Deuces, Double Bonus Poker, Bonus Poker, Jacks or Better, Deuces Wild, American Video Poker, 10s or Better, Five Draw Poker, Double Jackpot Poker. WildCasino.ag hosts a dedicated live dealer casino suite, which operates 24 hours a day, seven days a week. It’s unclear exactly who the software developer is behind Wild Casino’s live dealer games, but there is a good variety of variants here, including Live American Roulette, Live Baccarat, Live Blackjack, Live Blackjack Classic, Live Punto 2000 and Live Roulette. 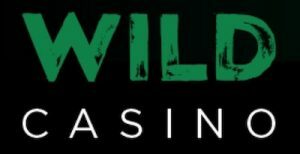 The payment methods available at Wild Casino are varied, and while there’s a good selection of credit cards, cryptocurrencies and bank transfers available for real money players, unfortunately we don’t get access to other popular methods like web wallets and pre-paid cards that are widely available at our other top-rated casino sites. The limited deposit selection is likely due to Wild Casino’s acceptance of players from countries like the USA where payments made for online gambling are heavily regulated, and keep in mind the deposit methods available to you may depend on where in the world you’re playing from. Note: Payment methods marked with a * denote the options that are also available for withdrawing your winnings. Wild Casino does not advertise its deposit limits or payment processing times. Where Wild Casino loses a few points is with its $50 withdrawal fee. Players are only allowed one free withdrawal every 30 days, with additional pay out requests subject to a frustrating $50 processing fee. Even more annoyingly, it is the responsibility of the player to request the $50 “discount” when requesting the free monthly pay out. During our testing, there were some error messages across the site, but we hope that’s due to teething problems as the casino finds its feet. We’re not psyched about the $50 withdrawal fee, and are still a bit confused about what’s going on with those Nucleus Gaming/BetSoft rip-offs, but otherwise Wild Casino has lots of strong points. We love that players from the USA and Australia are accepted, and the welcome bonuses that can be used for different game types puts a cool new spin on things, provided you read the t&cs. Overall, this is one worth giving a go for yourself.